The growth of Spirit-empowered Christianity has been nothing short of phenomenal. From a handful of believers in the early twentieth century to a global movement today numbering over 600 million people in almost every culture and denomination, those who embrace the Holy Spirit and His gifts are now the fastest growing religious group in the world. This book is an authoritative collection from more than two dozen leaders in and scholars of the Spirit-empowered movement in Asia and Oceania. Focusing on the future of the movement, these world-renowned scholars address the theological and cultural challenges of the new century and share emerging insights on how the next generation will face them. 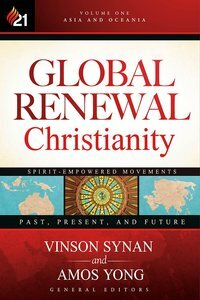 About "Global Renewal Christianity (Vol 1)"
Amos Yong (Ph.D., Boston University) is J. Rodman Williams Professor of Theology at Regent University School of Divinity, Virginia Beach, Virginia. His books include The Spirit Poured Out on All Flesh; Hospitality and the Other; Beyond the Impasse: Toward a Pneumatological Theology of Religions and Spirit-Word-Community: Theological Hermeneutics in Trinitarian Perspective. More information about Amos Yong is available on the Regent University website.